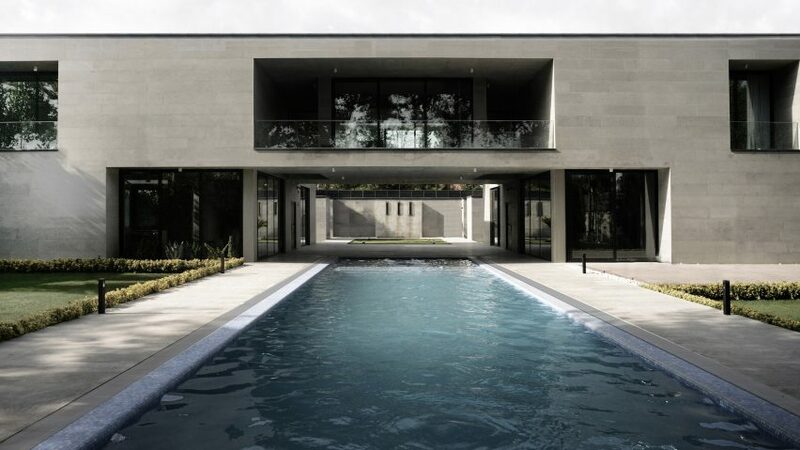 An elevated passageway spans a swimming pool to connect the two monolithic blocks of this weekend home in the Iranian city of Karaj by Kamran Heirati Architects. The Iranian studio built Villa Safadasht in the city's suburbs for a client working in the food industry. The building is divided into two parts: an entertainment area with a jacuzzi and an outdoor pool to cater to their sociable lifestyle, and a more private residence. "As a passage, this building was meant to connect both sides of the site and define itself as a window frame for spectators," Kamran Heirati told Dezeen. Unpolished grey Esparakhon – a local dolomite stone found in Iranian Azerbaijan – was used to clad the exterior and interior walls of the 1,100-square-metre house. "It was meant to be a simple, solid and pure object without any unnecessary complexity in order to only emphasise the openings and the green landscape," said Heirati. The second-storey passageway spans the width of the swimming pool, with skylights and glazed openings providing glimpses down to the water below. Large windows on each end of the passageway fill the stone house with natural light. Three balconies installed on the second floor along the facade, providing lookout points over the gardens. At the rear of the building, a thick horizontal concrete beam runs parallel to the passageway, forming an elongated void that opens the courtyard up to the sky. In line with traditional characteristics of Persian architecture, the firm sought to envision the building and garden as a whole entity. "[We wanted] to emphasise the presence of the site, not only as the exterior but also as a stream, which flows around and inside the building," explained Heirati. "The axes of the building and the site intersect at the centre or the 'heart' of the building – the heart in this scenario is a space where the exploration of the building starts and ends," he added. In fully opening up the central part of the house, the private and public are separated to allow "the landscape and regional wind pass though the building". Columns are placed 15 metres apart on either side of the swimming pool, and the concrete floor slabs reinforced so no additional supports block the view. At each end of the passageway, two concrete staircases connect the ground and first floors. In one block, light floods the central living area, casting shadows of the wires used to support the stairs across the space. Villa Safadasht was awarded first place in last years' Memar Awards – one of Iran's most prestigious architecture prizes – for the project, alongside Mosha House by New Wave Architecture. Following the lifting of crippling economic sanctions, Iran is "on the verge of a new era for architecture" according to local architects. Recent projects in the Islamic Republic include Keivani Architects' seven-storey apartment block in Tehran and an another apartment block in the city that features ridged granite and timber shutters, designed by Ayeneh Office. Photography is by Ali Daghigh and Abdolreza Bassiri.